What's Up with Facebook's Workplace? Facebook’s Frerk-Malte Feller shares on Workplace adoption and partnership strategy ahead of EC18 keynote. 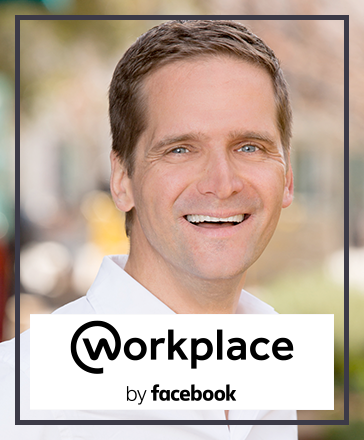 As Facebook readies itself for its Enterprise Connect debut next week, keynoter Frerk-Malte Feller, director of Workplace ecosystem partnerships, took some time to catch me up on where things stand with the company's enterprise-focused team collaboration app, Workplace, and where it's going next. In the year and a half since launching Workplace, Facebook has signed on more than 30,000 organizations around the globe, the company has reported. These customers range from the smallest of the small -- a small nail salon in London with a dozen or so employees -- to the largest of the large -- Walmart, the largest private employer in the world with some two million employees, Feller told me. Between the extremes are companies such as Delta Airlines, Starbucks, Spotify, Lyft, and Deliveroo. "And we're not done yet," Feller said. "We're certainly encouraged by the first year and a half, but our vision is to bring new transparency and interactivity to all organizations around the world." The beauty of Workplace, Feller said, is that people are familiar with Facebook; they know how to use it and so start using Workplace immediately. And while organizations adopt Workplace for productivity gains, users experience the side benefit of feeling better connected. "It reduces the distance across office sites, and people feel more closely connected across hierarchies as well," he said. Given its universal appeal, Facebook doesn't really have a sweet spot when it comes to the type of companies it targets with Workplace, Feller said. The difference is more around how Facebook works with a company, depending on size, he added. For example, a small nail salon wouldn't have much need for product integrations or handholding, while large enterprises would require "all the usual enterprise SaaS suspects" and more personalized attention, he said. "We have a strong ecosystem in place on service and product integration that allows us to serve the individual needs of each business," he said. And to those naysayers who question whether Workplace is really enterprise-ready, Feller pointed to those 30,000 customers as evidence that this should no longer be a concern. "I think this was a concern maybe a year and a half ago when we first got going, but not today with how we've evolved the product," he said, pointing to Facebook's ISO 27001 security certification as one example. "We've invested heavily in enterprise security, in addition to the security underpinning the Facebook platform." Facebook sees one of its enterprise strengths as its ability to collect customer feedback and respond, Feller told me. For example, after launching Workplace initially, Facebook reviewed customer feedback around usage and responded to user needs by building a Workplace Chat desktop application. "Desktop is still an important surface for many people," Feller said. "It's not just about mobile for everyone." Facebook attaches a lot of weight to strategic partnerships in helping the company meet its goal of turning Workplace into the command center of work," he said. "We are no longer working in a world operating like a walled garden," he added. Facebook distinguishes between service and product partnerships. On the services side, partners like Deloitte and Slalom are important for helping users get the most out of Workplace by encouraging them to think differently about how they get work done, Feller said. On the product side, lots of integrations are fundamental, he added. These include single sign-on, productivity tools, video collaboration. "Our goal is really not to grow the ecosystem to its largest max," Feller said. "We want to make sure people have access to the tools that help them do their jobs better. It's a people-first strategy. We're not just doing integrations for the sake of integrations. It's to help give people a way to manage the exploding business SaaS ecosystem." When Feller takes the stage for Facebook's keynote on Wednesday morning, expect to hear more about how Workplace has been successful in changing the environment in which people work. Additionally, Feller will dive deeper into Workplace's strategy around integrations and how its partner ecosystem is a key enabler of its success. Moving forward into 2018, Facebook is looking to push that command center notion, Feller said. The company will be investing in its efforts to "connect everyone," and exploring use cases to make teamwork even easier, he added. At Facebook's F8 event in May, expect to see an expansion of the integrations available with Workplace as well as developments around connecting multi-company groups through the platform, he said. Feller will take to the keynote stage on Wednesday, March 14, at 11:30 a.m. And attendees can learn more about Team Collaboration in general at Enterprise Connect 2018, March 12 to 15, in Orlando, Fla. Register now using the code NOJITTER to save an additional $200 off the Regular Rate or get a free Expo Plus pass.